Years ago when living in Southern California I had a neighbor who was an accomplished artist fresh out of the New York City art scene. He had several of his large abstract pieces that were sandblasted and splattered with paint rolled up and tucked under my porch for safe-keeping. These were evidently cutting edge compositions that had fetched $40,000 each back in the late ‘70s; and here they were lying under my porch exposed to the elements for months at a time. This artist, who will go unnamed, had quite a history before settling down in the little coastal town where my wife and I lived in the early ‘80s. Seems as though he was the boyfriend of a Hollywood starlet and was well connected for a while in the art circles of midtown Manhattan. Sometime during the height of his popularity he become enamored with the Photorealism movement that was becoming popular at that time and he fell out of favor with the art elites who used to pay him so handsomely for his edgy creations. To add insult to injury, he was afflicted with a habit of heavy drug use, a condition that would play havoc with his work and his life in different and bizarre ways during the time I knew him. Occasionally I would wander over to his place to see what he was working on. One day it might be a landscape with foreground, middle-ground and distance nicely done and the next day the same painting would have some religious figures down in a ditch in the foreground. Due to his prodigious use of drugs, I never knew what I would find each day. I remember one portrait of an Indian chief that was amazing in its execution and the feeling the piece evoked. The problem was, by the time I saw the finished painting, he had taken it to a compulsive level of finish that entirely ruined what had been so strong before. It’s unfortunate but true, that an artist occasionally needs, as the old saying goes, someone to hit him over the head when the painting is done (As a sad postscript to this story, this artist’s life seemed to mimic the same vicissitudes that his paintings underwent. One day while I was home painting I heard a blood-curdling scream coming from the yard next door. When I looked out the window to see what was going I saw this troubled guy up on a flight of stairs stabbing his landlord in the neck. The landlord fought back and threw him over the railing. Amazingly, my neighbor did a back flip in the air and landed on his feet, something I might not have believed had I not witnessed it myself. At that point I went into a sort of fight or flight mode and ran outside with a baseball bat that I immediately laid down next to me behind a three-foot cinder block fence in case my peaceful gestures didn’t work. I remember asking this artist to give me the knife, which he did, and I directed the two of them to separate until the police arrived. It was all so surreal and everything went off without a hitch—something I credit to an extra amount of help from above. After that I didn’t see much of this guy and found out several years later that he had committed suicide. It was a sad story that didn’t have a good ending). The point I make is that sometimes in life as well as art, too much is too much and a more centered approach will take an artist to greater heights. To be sure, stopping before the point of ruin would be a good skill for any artist to develop. In another example I remember an art-instruction book by an artist I had the good fortune of studying with for a week back in the ‘80s. Without meaning to be so, it was very instructive on this point. It seemed to me as well as another artist friend who mentioned it, that many of the step paintings looked better in the second-to-last step before the final painting. There was something clean about these penultimate steps that somehow got clouded with too much added flotsam in the finished work. So where is that magical stopping place and how do you know when you’re there? I wish I could say there is a clear-cut answer to that question, but truthfully, there isn’t. This is one of those things in art that just requires some tasteful decision-making. I remember being out painting with Ken Baxter some years ago and he mentioned that sometimes you just need to step back from the work, take a break and return a few minutes later out in the field to get a fresh eye. Considering the limited time you have on location I was amazed at his calm demeanor and easy going way, as though there were no time restrictions. I chewed on that for a while and decided that he was right, a few minutes of what may seem like down-time in the field might be just what an artist needs to work more effectively as opposed to more quickly. The same can be said for the studio, where you might possibly work over a problem for days in your mind before laying another brushstroke on the painting. The more we know, the more effective will be our execution. 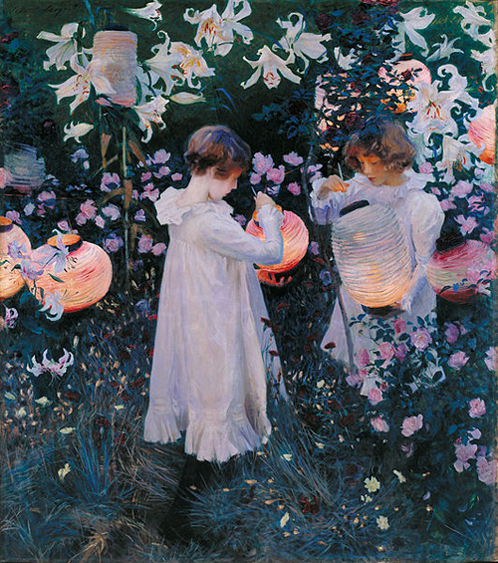 It took two summers for John Singer Sargent to finish “Carnation, Lily, Lily, Rose,” working methodically for 15 to 20 minutes each session and then scraping down each evening’s effort before he felt that he had it right. I suppose we, of the fast-food generation who become annoyed when our computers take a minute to boot up, could learn something useful from the past and “chill” a bit with regard to our approach and expectations.